Our goal at Ancestor Tracks is to help you track your early ancestors who moved through Pennsylvania through their land tracts! Ancestor Tracks is dedicated to publishing maps and land ownership information allowing genealogy researchers to more precisely pinpoint the locations where our ancestors lived. Land ownership maps are one of the most valuable, yet underused, tools available to researchers. 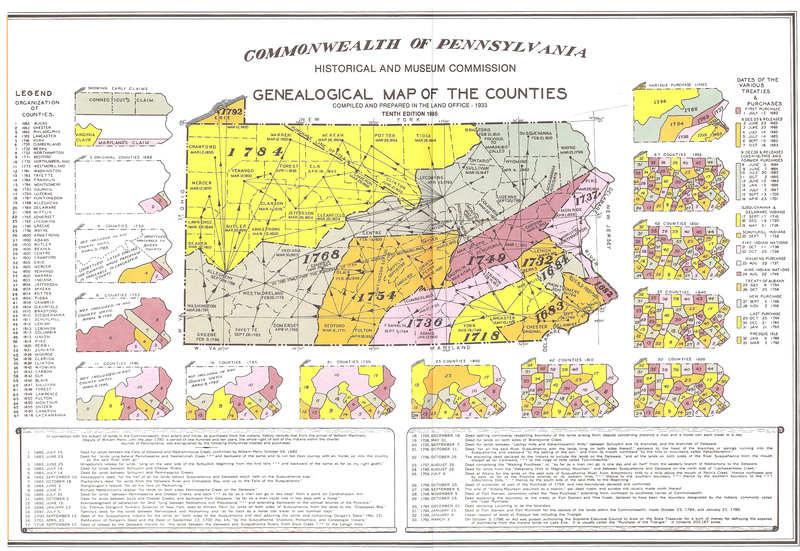 We now offer two product lines which complement each other: (1) state-wide Warrant, Patent, and Tract Name Registers which document the first transfers of land from the Penns or the state to private owners (see below); and (2) county atlases of the Pennsylvania Township Warrantee Maps on file at the Pennsylvania Archives in Harrisburg showing the exact metes-and-bounds tracts of early pioneers who purchased land from colonial or the Commonwealth of Pennsylvania authorities. As a service, we are also publishing online land ownership maps from the nineteenth century which can be used in conjunction with census records and published county histories. More specific information is available for newsletter editors, speakers and educators, professional genealogists, genealogical librarians , historical societies, and linking to our website. If you would like additional information, here is a PowerPoint Presentation (12.7 MB) giving further information about Ancestor Tracks. We offer 4 major resources for locating the earliest private purchasers of land across Pennsylvania: Warrant Registers for the entire state on a single CD, Patent Registers Indexes for the state on a second CD, Tract Name Indexes from 1682-1959+, and the New Purchase Applications Register. The first CD, First Landowners of Pennsylvania: Colonial and State Warrant Registers in the Pennsylvania Archives in Harrisburg, contains all 70 of the Warrant Registers showing the first transfer of land tracts from the colony or state to private owners. These are the people who applied for land from either the Propietors or the state. These records start in 1682 and continue through the Penn era to modern times, documenting the very first transfer of land from the government to private individuals. Every county register, containing thousands of pages, is on this CD. The dates of land transfers continue throughout the 1700s and 1800s and into the mid-1900s. NOTE: These registers document the first owners of land for approximately 70% of Pennsylvania and cover each county. The registers should not be confused with the deed registers located in the counties which show all subsequent land transfers. The second CD in this series, First Landowners of Pennsylvania: Indexes to the Colonial and State Patent Registers in the PA Archives, Harrisburg, 1684-ca 1995, contains the indexes to all people who actually were granted final title from colony or state authorities. In perhaps 40% of cases, they are not the same individuals who actually applied for the land (termed warrantees. The third CD, First Landowners of Pennsylvania: Indexes to Tract Names of Patented Land in the PA Archives, Harrisburg, ca 1684-1811, is the place to look when only the original name of the tract is known but not who the very first owners were. Finally, the fourth CD: the New Purchase Applications Register. This ledger contains the names of the warrantees and patentees and the descriptions of tract locations for about 4,000 tracts which settlers purchased after vast territory was opened to settlement by the Treaty of Fort Stanwix of 1768. Now Available: DAUPHIN COUNTY ATLAS! ; Early Landowners of Pennsylvania: Atlas of Township Warrantee Maps of Dauphin County, PA and its companion CD containing the full-size Township Warrantee Maps, as well as geo-referenced maps showing the original tracts superimposed over current roads, towns, subdivisions, etc. We have also posted the 1875 Landowner Atlas of Dauphin County for use with the 1860 and 1870 census records. Ancestor Tracks is committed to becoming a one-stop resource for researchers of early Pennsylvania landowners. In addition to publishing our own books, we are posting images of 19th century maps and atlases located in the Library of Congress. While the physical maps are in the public domain, the images we have taken of the maps belong to us and are not to be used commercially. For those researchers wishing to use them for personal use (including illustrating a family history you are working on), we give permission to use them as long as they are attributed to Ancestor Tracks. Our goal is to post landowner maps, or links to other websites with landowner maps, for every county in the state by the end of 2010. Red counties denote books and/or CDs by Ancestor Tracks , and also often contain free maps we have posted. Red shaded counties denote resources and/or free maps we have posted. Green counties represent other land tract resources known to Ancestor Tracks but not affiliated with us. Questions and free lookups in our books? Contact us at customer_service@ancestortracks.com. Also, please contact us if you know of any land tract resources, particularly early land ownership maps, which are available for any counties not colored on this map. Finally, If you find images which we have posted online that have been personally useful to you, a small donation would be most appreciated. (1) Click here for USGenWeb's Pennsylvania Digital Map Library, an outstanding source for land ownership in the 1800s. (2)	We have posted an excellent map published by the Commonwealth of Pennsylvania's Historical and Museum Commission showing the evolution of the counties starting in 1682 with the 3 original counties (Bucks, Chester and Philadelphia) to the creation of Lackawanna County in 1878. This map includes the Indian purchases. This map may appear to be illegible but it can be enlarged by clicking on it, and it may be printed or saved to your computer by right-clicking and selecting "Save Image As..."
(3) Harold Cramer maintains an incredibly valuable website on which he has posted maps of Pennsylvania (and surrounding areas) from four centuries: 17th Century, 18th Century, 19th Century and 20th Century. Take the time to become acquainted with the many pages of his site. Great job, Harold! (6) Another great resource, completely free, is the "Full-Text Collection" of over 1,000 books which have been scanned in their entirety and placed online by Historic Pittsburg, a joint effort of the University of Pittsburgh and the Historical Society of Western Pennsylvania. Note the tabs across the top of the webpage to choose from texts, maps, etc. (8) Access the entire Published Pennsylvania Archives series for free (all 10 series containing a total of 132 volumes) at www.fold3.com (formerly www.footnote.com). Either search for a name, date, place or topic in the series "Pennsylvania Archives" or click on "Browse" if you know the Series and Volume you want and then use the "Search within" box toward the top of the window. This site contains thousands of images of original Revolutionary and Civil War pension files through a partnership with the National Archives in Washington, D.C., but to access original records, there is a subscription fee. Again, there is NO FEE to access the complete published Pennsylvania Archives series! (9) "Allegheny Ancestry & Genealogy Trails" contains a wealth of information on Pittsburgh, Allegheny County, and some surrounding areas. Excellent resources!